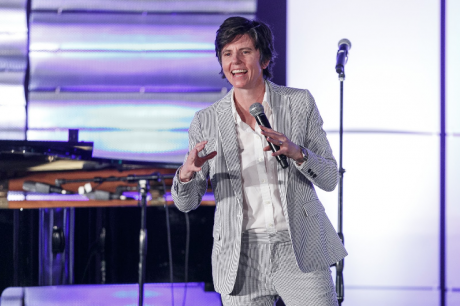 Comedian Tig Notario at the Family Equality Council's Impact Awards (California, 2017). Photo: Family Equality/Flickr. CC BY-ND 2.0. This summer, an old debate broke out again in Spain: should we put limits on humour? This time it was prompted by a monologue from comedian Rober Bodegas in which he mocked gypsies that steal cars, don’t know how to write, and marry 13-years-old girls. The comedian was accused of racism by gypsy people, whereas some of his colleagues defended him, arguing that humour’s purpose is to provoke and transgress social rules. Even if Bodegas was laughing at archaic stereotypes, they said, people should have taken it with humour and as a simple joke. After receiving more than 400 death threats, according to Bodegas, and thousands of angry comments on Twitter, he apologised and the video of his monologue was removed – but the questions it raised remain live. Jorge Cremades previously provoked a similar debate. He became famous with comic videos featuring a raft of sexist clichés. On Facebook, he has seven million followers. In June 2017, feminist groups asked people to boycott his show at a Barcelona theatre, calling him “macho and patriarchal”. What’s the right answer? Should we stop making or ban jokes about groups that experience discrimination, or should we give comedians complete freedom to laugh at whatever and whoever they’d like? According to presenter and comedian David Broncano, jokes can’t be limited as there will always be someone offended by them. I understand his point: censuring some topics is contrary to the transgressive nature of humour. But who says we must censure topics? When oppressed groups react against a joke, it doesn’t mean they want to put up limits in humour. The demand is rather that comedians bear in mind from which position are they making these jokes, and understand the effect of such a powerful weapon as humour. Humour is instrumental. That is, it can serve different purposes depending on how we use it. Usually we think about it as a way to make someone crack up by destroying social rules, but it can be used to marginalise people too. “Who are the protagonists of most jokes? People that are excluded… Humour is used also to put people in [their] place”, said Asunción Bernárdez, director of the Instituto de Investigaciones Feministas, earlier this year. In other words: when a comedian laughs at discriminated groups from a privileged position, what he is doing is re-emphasising difference and relativising the oppression that these groups suffer. What outrages people is not the single jokes of a single comedian; it is the pervasive discrimination that comes to light through these jokes. The problem is not a comedian making a racist or sexist joke, the problem is a racist and sexist society that puts him on prime time and laughs along with him. When you understand the violence behind humour that, using the excuse of being transgressive, plays with racism, sexism or homophobia, it starts to provoke anger instead of laughter. And you realise that making fun of oppressed people is the least transgressive thing you can do. 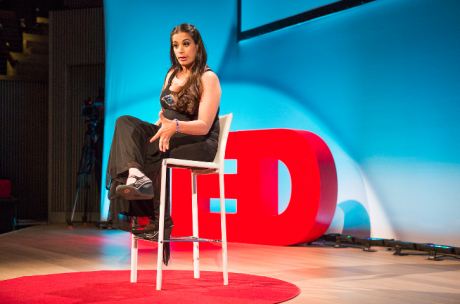 Maysoon Zayid in her TED Women talk (San Francisco, 2013). Photo: TED Conference/Flickr. CC BY-NC 2.0. Against easy humour that uses stereotypes to laugh at others, the feminist writer Brigitte Vasallo proposes to “point inside or to point up” – and laugh about yourself or those who are more powerful than you. This is not utopian; there are already feminist comedians that can make you cry with laughter like Patricia Sornosa, Ali Wong or Tig Notaro. And some of them talk about minorities and oppressed groups too. “If there was an Oppression Olympics, I would win the gold medal. I'm Palestinian, Muslim, I'm female, I'm disabled... and I live in New Jersey,” is how actor Maysoon Zayid starts I got 99 problems and palsy is just one. Zayid can make fun of her conditions and express irony that is actually empowering. This is what feminist humour is about. Making fun of the privileged is not new for Spanish comedians who openly mock governments and establishments. But most are men who seem to have forgotten to laugh about themselves – and patriarchy. Artist Lula Gómez commented on this in one of her feminist videos called “Eres una caca” (You are poop): “Maybe unconsciously, maybe not, but they aren’t able to make jokes about their own privileges as men”. Some people might not agree with my analysis. At least, you should agree with me that humour consists of distorting reality and, to do this, we need to start from the same reality, from the same common point. When we make a joke, we must take into account the social context in which we make it, and we know that a lot of people are still discriminated against in our reality. That should be our common starting point.